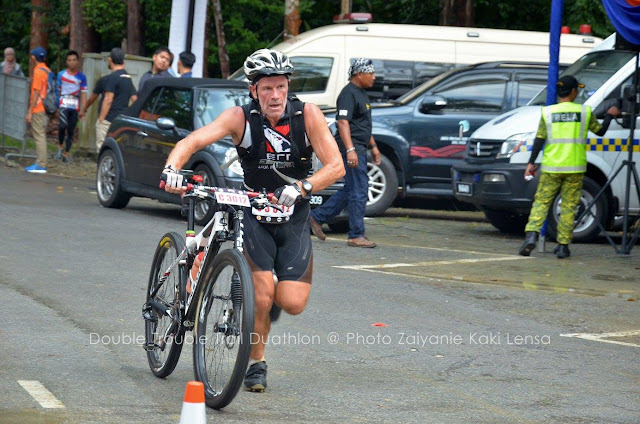 Thanks once again must go to Elsa for discovering this proper off-road Duathlon. There sadly are not that many multi sport options off-road, which is something I am hoping through amongst other things, my involvement with XTERRA Malaysia, going to address over the next few years. 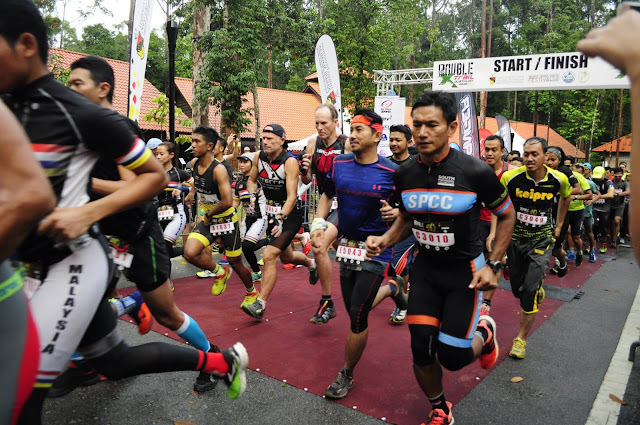 Thanks too for the Irwan and his team at 30 Ascend who organised the event. It was apparently their first and based on your first attempt guys I’m sure it’ll be the first of many. At least I hope it will be. Thanks to the weather “gods” as well who decided over night to lash it down with rain and in the process make the race a really slippery and somewhat sticky affair, which I have to confess are my preferred conditions. As these sorts of conditions make it less about absolute speed and more about strength, control and resilience. Finally thanks are to all the other competitors who made the race a social occasion as much as a great examination of how my training for the Off-road World Championship later this year is coming along. The headlines for the race involved a 5km run, a 30km bike and then the same 5km run but done in reverse. This particularly pleased me as whilst out checking out both the run and bike course the previous day I had said how nice it would be if the organiser could do that. 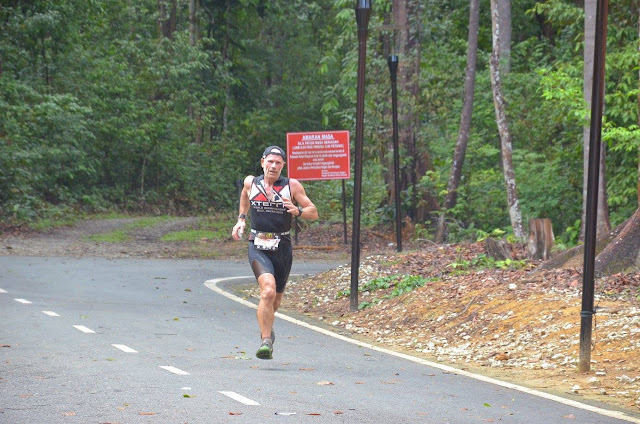 Yes that’s right, I was checking out the course as there was no way that I wanted to lose my way again like in Cyberjaya. 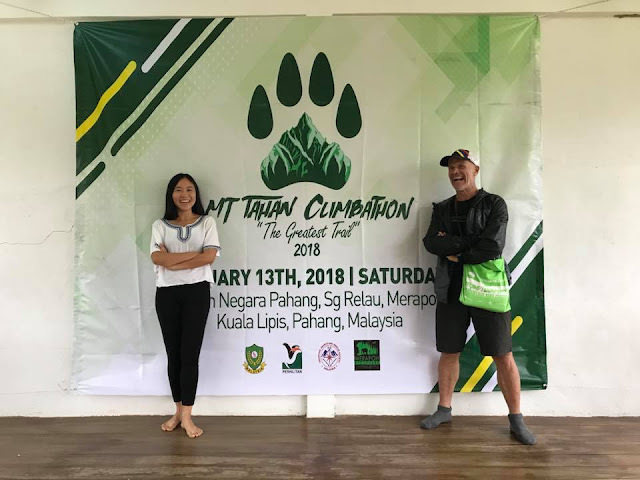 This event had a Veteran’s Age Group starting at 40+ years of age so as well as being up against the ever young and competitive Razani, this time I would have Wong Ah Tiam and I suspected quiet a few others to contend with. As such, despite well intended teases from certain quarters about being on the podium, I had adopted a blind regard for that sort of goal given hoe uncontrollable it is and set myself a target time of 2 hours and 30 minutes given the muddy conditions. Due to the heavy rain overnight inevitably there was a need to recheck the run & bike course’s thoroughly and understandably, there was a slight delay to the start of the race. Once we got going though did the lead runners try to make up for lost time. They literally exploded out from under the start arch and before the first 250 metres had elapsed I was faced with having to rewrite my race plan. As originally, I had envisaged tucking in behind Andrew Lanham who is great runner and getting dragged round the first run by him. In order to have executed this plan I would have needed to attach a grappling hook to the back of Andrew’s shorts though as at around the 250 metre mark I was forced to back off and let him go ahead to reduce a heart rate that was so elevated I felt it physically sticky out of my chest. Razani didn’t seem to have such a problem though and he cantered past me in pursuit of Andrew and the rest of the lead pack without an apparent care in the world. Casting these thoughts aside and reminding myself of my game plan which was 2 runs of 25 minutes a piece and a bike split of a 100 minutes I settled into my rhythm and allowed the spiked heart rate to feel a tadge more comfortable. After the mad dash down the initial section of flat trail the course started to loop right to eventually lead us back to T1. At this point after a short descent we reached the only really section which had any climb of note on and at this point I started nibbling my way through the field that had flown down the initial bit of trail. Shortly after this we came off of the fire road 4 wheel drive type trail and entered some really nice flowy forest trail. This was not quite single track so there was always room to pass and again this slightly more technical trail suited my running better than others and I even caught and passed young Saiful Khohar and now had regular glimpses of Razani’s distinctive orange running top up ahead which was quietly reassuring. As I came into T1 to the shouts of encouragement from the various supporters, including my favourite one Elsa Ng, I had a peek at my watch and noted that I was 4 and a bit minutes ahead of my schedule and simultaneously took account of who else was in our (the 40+ age group) section of T1 other than Razani. There was no one visible and I filed away that I was currently in 2 nd place. 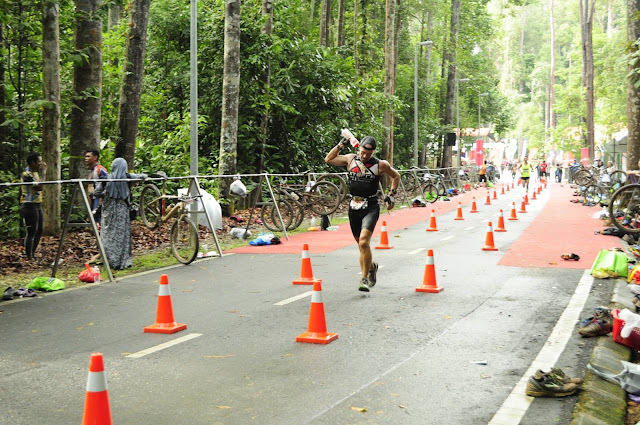 Turns out that I actually exited T1 before Razani and at the same time as Saiful who had obviously hung onto my heels on the run and had a better transition than me. My transition wasn’t anything more than steady and controlled which is what I like to have as rushing things in this area usually costs rather than saves me time so I assume that Razani had some technical issue that slowed his down. Knowing that I was that close to two exceptionally strong riders encouraged me and I don’t mind confessing in the draft legal world of off-road racing I had fleeting aspirations of at least sucking young Saiful’s wheel for as much of the next 30km as possible. Similar to my aspirations of tracking quietly behind Andrew on the 1 st run though that thought was very short lived as despite him being a courtesy and lovely young man who serves his wife and country faithfully in the Malaysian Navy he did not extend me any of his usual courtesy and proceeded to ride away from me. Thankfully, I was at least able to have a sufficient enough tow to help me catch up and pass Andrew who I assumed would now be on my wheel and adopting my run strategy to much better advantage on the bike. Despite being the 2 nd runner back into T1, ahead of the likes of Shahrom & Razani and only being bettered by the flying Asmuni from the Open category. 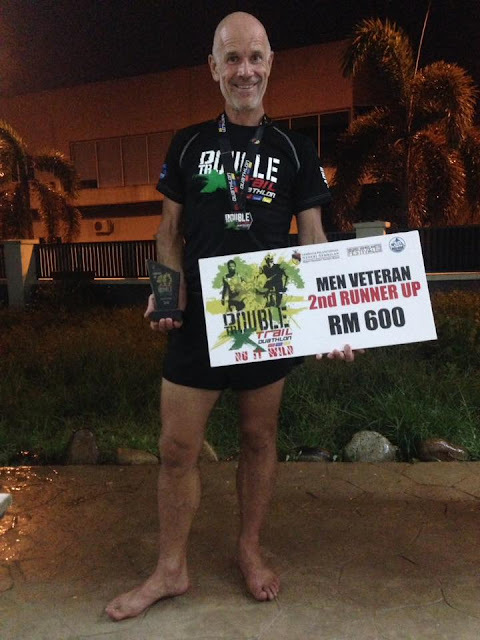 (Bravo Andrew – please come back to Ipoh to train me to be this fast. 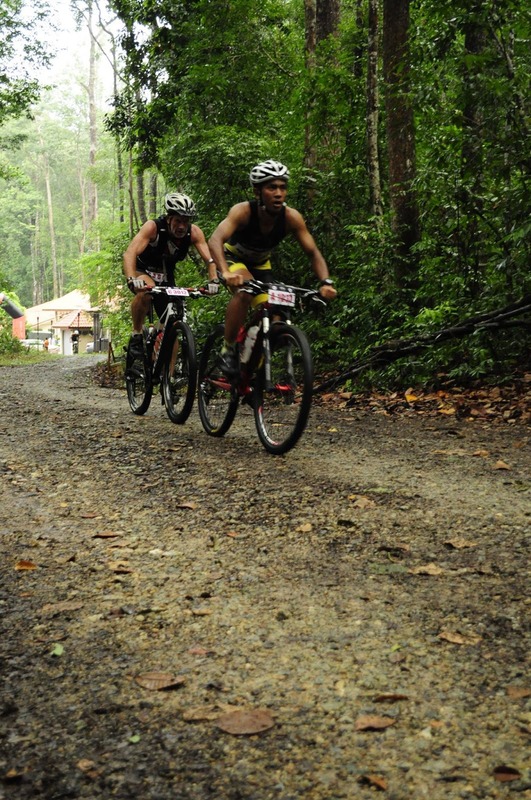 ), sadly it wasn’t to be Andrew’s day on the bike and in the same way as Saiful effortlessly dropped me I was able to ride away from Andrew too. After this I rode pretty much alone until entering the Kampung when Wong Ah Tiam (in my age group) and Halif a Naval colleague of Saiful’s caught me. 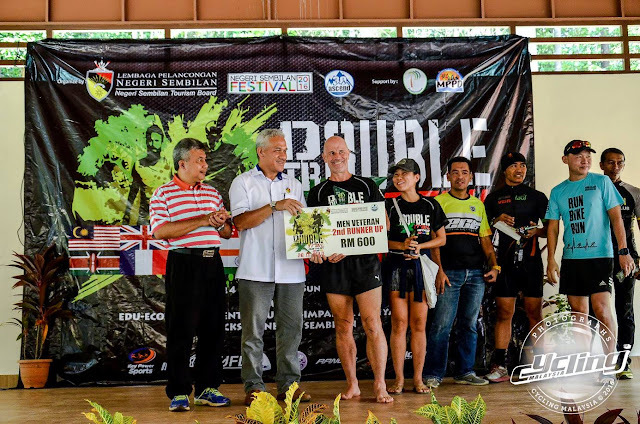 Thankfully neither of them repeated what Saiful and Razani had done to me and we proceeded to ride or run through the unrideable swamp sections that gave the race its “Double Trouble” title. In fact I led both through the twisting and turning tight single track that connected these swamps to rejoin the main trail we’d ridden out on and all be it only slightly I pulled back away from both. I think this was more down to the extra agility and maneuverability of my 27.5 inch wheels versus there 29’ers as once we were on open trail again both caught and passed me as did a few others. At the time I thought this was because of me physically puncturing but later on that evening I discovered on unloading my bike that it was the rear wheel of my bike that must have had a slow puncture as it was now completely flat. I don’t think that this would have really made that much of a difference how little of the course remained and how I’d not sensed a noticeable loss of air in the rear tyre. So I’m left knowing that I really must work with real vengeance and aggression to get more power into my legs so that I can put more wattage through the pedals of the bike leg. Entering T2 I noted that I was also ahead of schedule by almost 4 minutes on my target time and have to confess that I got caught up in all the excitement as the supporters my own and the impartial ones confirmed my now 3 rd place position behind Razani & Wong and with the words “your only a minute down” (they lied to me it was actually 1 minute & 19 seconds) ringing in my ears I set out after Wong with the best of intentions of catching and passing him. Sadly with just 37 seconds separating us I run out of trail though and had to settle for 3 rd place which given that I was just under 5 minutes inside my target time I was more than happy with. Had I been in a position to overtake Wong on the run, despite being always focused on being the best I can be, I would have actually thought twice about it doing so in this race and had told myself that if I could catch him I would cross the line together with him. The rationale for this is that when he saw me struggling on the final section off the bike leg on more than one occasion he slowed and offered me his back wheel. This gesture was a fantastic example of sportsmanship and given that Wong has always been one of the people that I truly admire in the world of Malaysian endurance sport his gesture reinforced what a privilege and honour it is for me to race with guys like him. Anyway, this sentimental gesture on my part couldn’t happen as I wasn’t good enough to catch him and as well as more power on the bike I need to find a kick on the run to avoid needing distance to make up time. Getting dirty and wet while racing in Mother Nature’s playground really is much more exhilarating than being on road and heaps more fun. We should all give it a go and I must find a way to help us put more of these types of events on in Malaysia. Razani is truly an awesome athlete. As despite being just 5 years my junior he is in a class of his own finishing 3 rd overall and a full 12 minutes ahead of me which is almost 2.5 kilometres in physical distance. Note to self – Ask him to share his training secrets with me! Finally, don’t put podium pressure on yourself and focus on a SMART (S - specific, significant, stretching. M - measurable, meaningful, motivational. A - agreed upon, attainable, achievable, acceptable, action-oriented. T – Time based/framed.) race plan and goal that helps you focus on getting the best out of yourself. 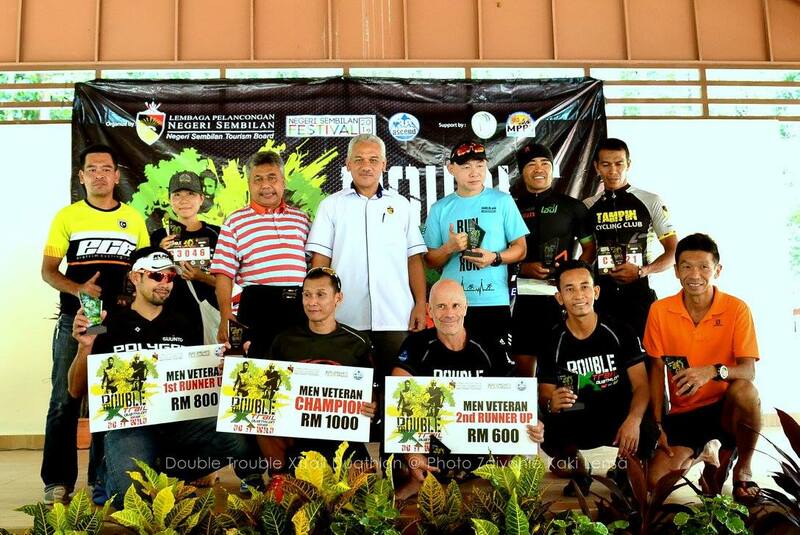 As a result, this race was just like at the Putrajaya Duathlon and Saipan XTERRA races earlier this year. It wasn’t a win, but proving that doing this stuff isn’t about winning, I am left not only feeling that I really got the best out of myself in the race, but on top of this I got the bonus of two important insights for further improvement. Namely find more power on the bike and a kick on the run ;-).